In July of 2017, President Trump upended years of military research and planning by summarily banning transgender people from military service. Since then, multiple court cases have challenged the ban, leaving current and future trans service members living in frightening uncertainty. 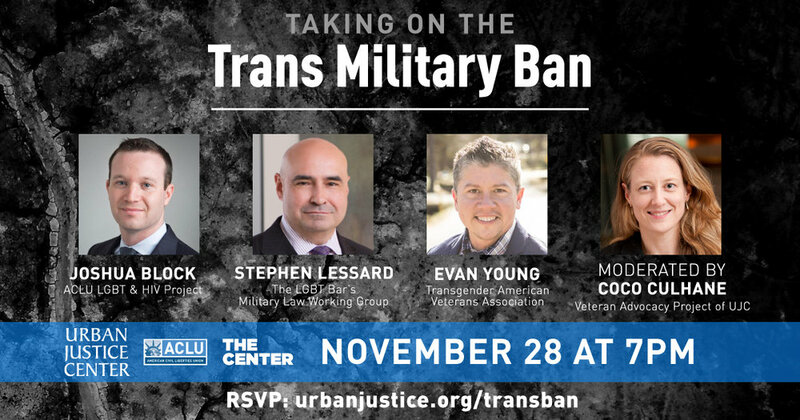 Our panel of veterans and other experts discussed the current state of the ban, as well as their thoughts on the future of trans and LGB people in the armed forces in America. Joshua Block is a staff attorney with the National ACLU's Lesbian Gay Bisexual Transgender & HIV Projects. He is a member of the legal team Stone v. Trump, the ACLU’s lawsuit challenging President Trump’s attempt to ban transgender people from serving the in the military. He is also lead counsel in G.G. v. Gloucester County School Board—the first federal court of appeals decision recognizing that Title IX protects the rights of transgender students to use restrooms consistent with their gender identity. In 2012, he was named one of the "Best LGBT Lawyers Under 40" by the LGBT Bar Association. Josh is a graduate of Amherst College and of Yale Law School. He clerked for Judge Robert D. Sack on the U.S. Court of Appeals for Second Circuit. A former surface warfare officer, Mr. Lessard spent 20 years in the U.S. Navy before becoming an attorney. He was named in Super Lawyer’s New York Metro Rising Stars list in 2014, 2015, and 2016. This past May, he received the New York State Bar Association’s President Pro Bono Service Award. In November 2013, Lessard helped spearhead The LGBT Bar’s legal advocacy initiative on behalf of transgender U.S. military veterans. Lessard co-authored a groundbreaking report on the military’s procedures regarding DD-214 discharge paperwork and its impact on transgender veterans, and with his employer (the law firm Orrick) provided pro bono representation to a group of trans veterans seeking to amend their paperwork. Evan Young is the President of the Transgender American Veterans Association. He is a retired Army Major that served from 1989-2013 with 7 years as an enlisted soldier before gaining his commission. Evan lives in Arkansas with his partner of nearly 3 years, 15 year old step son, and 11 year old twin daughters. Coco Culhane is the founder and director of the Veteran Advocacy Project at the Urban Justice Center. She is an adjunct professor of clinical law at Brooklyn Law School, where she teaches the Veterans’ Rights Clinic.